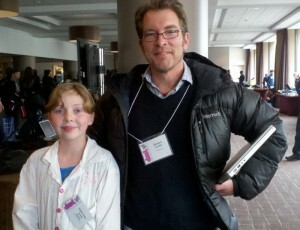 I met Super Awesome Sylvia at DML2012 in San Francisco a few weeks back. Her dad @techninja42 took this photo of us. Super Awesome Sylvia spoke on a panel with Gever Tully (tinkering school), Jess Klein (Hackasaurus, Mozilla) and Dr. Preeti Gupta. She showed some clips from her maker show, episodes where she gets to destroy things, make things, experiment with stuff—sewable circuitry, Arduino, Coke Mentos Rockets, and MakerBot, among other things. Totally fun. I had just spent the last few days at The California Academy of Sciences, working on our Universal Badges project for the Mozilla Foundation, etc. Seeing all the kids at the Academy (they supposedly have close to 2 million visitors a year), and talking a bit with Super Awesome Sylvia at DML2012, made me think of our projects at home. 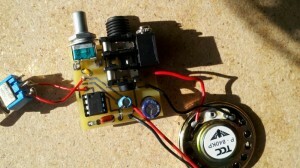 I was inspired to push forward with Hazel to complete our Etsy DIY amp (hesslerk). After viewing some of Super Awesome Sylvia’s shows, we set to work soldering (lead-free!). We need to troubleshoot, as the amp is distorting, but it still sounds pretty dirty and fun.